My November arrived! Yippee. The theme of this months box is peacock and it’s bloody beautiful. Birchbox teamed up with Tatlet magazine to design a party season box. It’s fantastic! This months Box had 2 make up products, so exciting. The first is the Obsessive Compulsive Cosmetics Lip Tar Primer. This retails for £15 for a full product. This essentially primes and prepares lips for lip products. It helps the lips to stay moisturiser and helps lip products last longer and look fabulous. Definitely looking forward to trying it out. Next is the Midi Wet Brush by Wet Brush. This is pretty much a hair brush, retailing at £11.99 it combs out any knots and tangles whilst being gentle on the scalp. Really appreciate this as I hate buying hairbrushes! My collection of NUXE products are growing each month! I also got the NUXE Crème Prodigieuse. Retailing at £21 for a full size bottle. It’s a moisturiser that is full of blue everlasting flowers and helps to boost the skins antioxidant levels. Lovely! A Birchbox exclusive was also included, this is the Beauty Protector Protect and Detangle Spray. This product is an all in one spray that conditions, smoothed, adds shine, set angles and protects hair. Retailing at £18.50 a bottle I have high hopes! The final item I got is the Bbrowbar Brow Pencil in Indian Chocolate. This retails at £13 a full sized product and the colour is a medium brown shade. I never really focus on my eyebrows so much, can’t wait to see if this product changes me! Well there you have it. 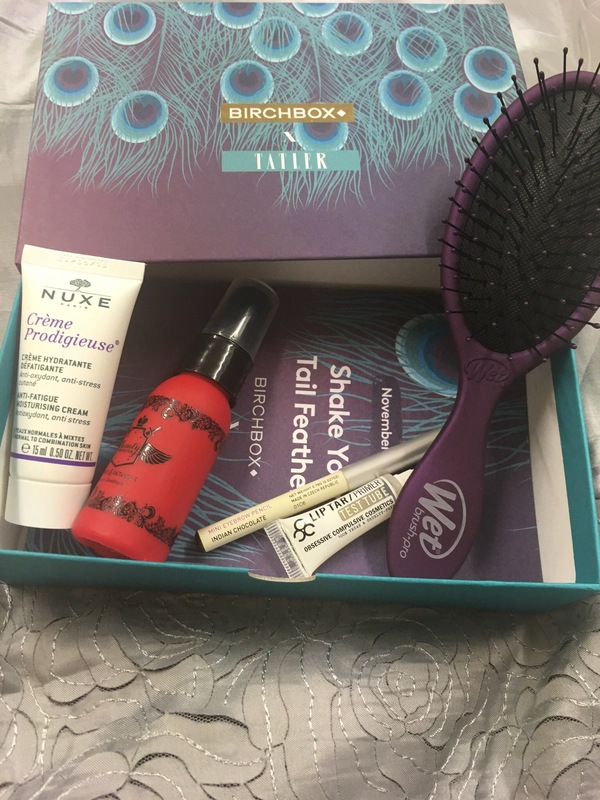 My November Birchbox! What did you guys have in yours?